The skull of an adolescent tyrannosaur, discovered in a quarry in Alberta, Canada, in 1994, shows signs of vicious battles. Of particular interests to scientists, however, are signs the dinosaur was then eaten by members of its own species. The skull belonged to a 500kg, six-meter-long Daspletosaurus, a smaller cousin of T. Rex, which was also believed to be cannibalistic. The results of the crowdfunded study, led by Dr. David Hone of Queen Mary University of London, were published in the online journal PeerJ. “This animal clearly had a tough life, suffering numerous injuries across the head including some that must have been quite nasty,” Hone said. The wounds include punctures and breaks on the bones and one part at the back of the skull been snapped away. Some bite marks found on the skull have the shape of tyrannosaur teeth. 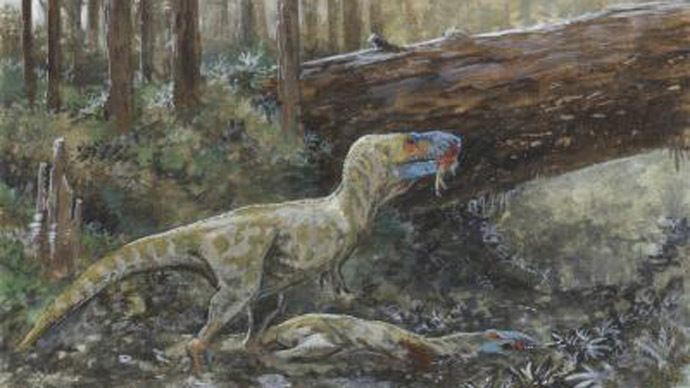 The study also revealed the Daspletosaurus was bitten both while alive and after it had died. A large tyrannosaur, probably another Daspletosaurus, most likely ate the felled adolescent. However, the exact cause of death is unknown. “It is not possible to distinguish easily between cannibalism and feeding by another tyrannosaurid,” the researchers said. The Daspletosaurus lived 75 million years ago – 10 million years before T. Rex – in the same part of modern-day Canada as another related species, the Gorgosaurus.